Why is the Old Testament Law in the Bible? How is it relevant for us today? Many followers of Jesus ignore the Law they read in the Old Testament, and a few people pick which parts of it they want to follow and dismiss the rest. As for me, I’m searching for a way to connect the Old Testament Law with my faith and make sense of it without being weighed down by it. Courtesy of Matthew, we know that Jesus came to fulfill the Law but not eliminate it (Matthew 5:17). In addition, Paul writes that the Law of the Old Testament served as our “guardian” until Jesus came (Galatians 3:24). Does this mean we can get rid of the Old Testament Law? Not so fast. The word guardian is interesting. Let’s dig into it. In considering some fifty translations of the Bible for this verse, Guardian occurs in 17 of them. Here are some of the words used in other versions: tutor (12 times), schoolmaster (7), disciplinarian (7), custodian (4), “in charge of us” (4), teacher (3), guide (3), governess (2), trainer (1), chaperone (1), babysitter (1), child-conductor (1), master (1), and gateway (1). And just to be thorough, we have pedagogue (1), under-master (1), and “watching over us” (1). Finally, the Message says, “we were carefully surrounded and protected by the Mosaic law,” that is, the Old Testament Law. Let’s consider the theme of education (tutor, schoolmaster, teacher, guide, trainer, and more). In elementary school I learned the basics from my teachers. In junior high and high school, we built upon our basic education to more fully understand our lessons. And in college we expanded our understanding further. Then later still, our life lessons built upon all our formal education. In the same token, we shouldn’t view the Old Testament Law as wrong or irrelevant, but it is incomplete. We must build upon it. The Law moves us forward in our faith in Jesus. Then, as we mature, our understanding transcends into something more, something much more. It’s as if the Old Testament Law gets us started and points us in the right direction. Then Jesus furthers our education by building upon it. The Law isn’t something we should ignore, nor is it the goal. 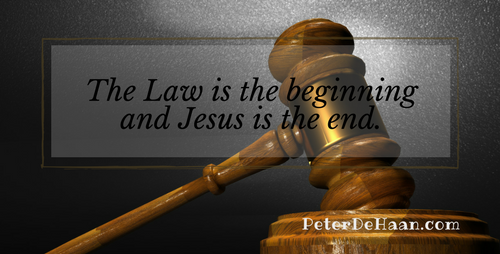 The Law is the beginning, and Jesus is the end. Great depth of explanation. Thank you and Happy Easter to your family. He is risen, He is risen, indeed. Susan, happy Easter to you, too!